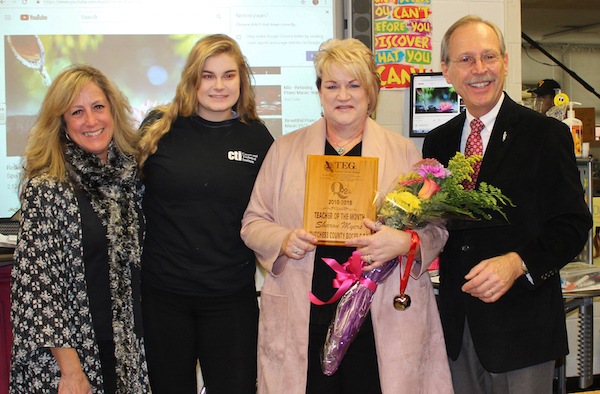 Cosmetology teacher and Skills USA advisor, Sharon Myers, had a surprise visit from Michelle Taylor and Joe Daily of Q92 on November 28 at the Dutchess BOCES Career and Technical Institute. The morning team visited to present her with Q92’s Teacher of the Month award. One of her students, Annie Davidson, credited her for helping her to become the person she always wanted to be in her nomination letter. "Mrs. Myers saw something inside of me when I didn't,” Annie wrote. “She makes me, as well as all the students in our class, feel as though they can achieve whatever they want in life." In addition to a plaque, Mrs. Myers received other gifts, including a $100 gift certificate from Cosimo's in Poughkeepsie and a $100 gift card from TEG Federal Credit Union to use for something special for her class. TEG Federal Credit Union sponsors the award.